Or at least looks like he's been. 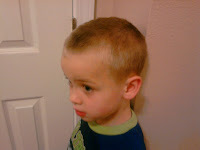 So, I guess because I can dye my hair successfully, I thought I could cut a little boy's hair successfully. Hah. Not rocket science, right? Wrong. I realized my mistake pretty quickly, but by that point I was already committed. I had to finish the job or leave him looking like an escaped mental patient. I figured looking like a cancer patient would win more pity and less jeering, so I carried on. I think it would have gone slightly better if he'd been capable of sitting still, but I should have been expecting that. I've been a mother for five years. You'd think I'd know he can't sit still. Duh. So, the lesson learned is this: If it requires professional training, leave it to a professional. Anyway, he was a good sport about it and he's laughed more than I have. (Note his forced smile. He was smiling like that as he was he was telling me he likes his new haircut.) 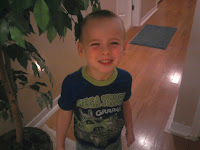 Luckily, his hair grows as fast as mine so it won't even be noticeable before long! Everyone have a fabulous Pi day and please never attempt to cut your hair or that of someone you care about. Ever. Thanks.